I suspect many people will be wondering why Alastair Cook put Australia into bat after they reached 287-3 on the first day of the final Ashes Test. The England captain admitted it was a marginal decision but was clearly hoping to prey on the batting frailties that his bowlers had so ruthlessly exposed in their victories at Edgbaston and Trent Bridge. A couple of early wickets could easily have opened the floodgates and allowed England to roll Australia over once again. I doubt, however, whether Cook would have chosen to bowl had England needed to win this match to win the Ashes, but with the series in the bag he gambled on Australia's fragile confidence and I don't think you can question the logic of his thinking. As it happened, Australia's openers got stuck in and batted exactly as they should have done in the previous Tests. In what turned out to be pretty good batting conditions, they left the ball much better on a slow pitch and showed far sounder footwork. Chris Rogers battled hard for his 43 and David Warner resisted the temptation to go after every ball as he compiled 85 - his highest score of the series. 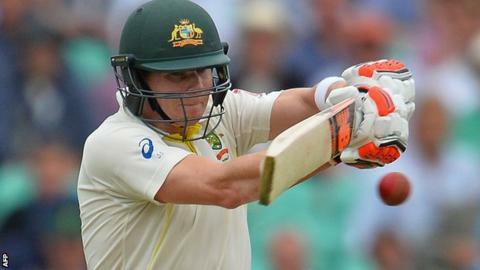 Later in the day, Steve Smith began to rediscover the form that appeared to have deserted him with an unbeaten 78 and Adam Voges made a good case for retaining his place with 47 not out. How frustrating it must be for Australia's supporters to see their players displaying such patience and application when the series is already gone. On English wickets, you have to battle away and work hard for every run, but by the time Australia woke up to that reality it was too late. Australia's batsmen showed they can play, but it takes more than one innings to entirely banish the demons of the series and they could still be vulnerable in their second innings. If England can get their foot back on the gas and take some early wickets on Friday, there's no reason why they can't still muster a first-innings lead and get into a position from which to win the match. Whatever score Australia manage to post, I'm looking forward to seeing England bat under the type of pressure that has been absent in the past two Tests. Opener Adam Lyth will be playing for his place, Cook could do with some runs, while Jos Buttler will be sensing an opportunity to end his own sequence of low scores. Australia, meanwhile, will hope to hit England hard and send Michael Clarke into retirement with a victory. The guard of honour with which England greeted Clarke in his final Test was a lovely gesture in a series that has been played in a good spirit. But there was no fairytale for the Australia captain as he scratched around for 15 runs before nicking Ben Stokes through to Buttler. Whether out of desperation or disbelief, Clarke reviewed the decision, but it wasn't long before he was walking back to the pavilion with the gait of a condemned man. Clarke's arrival and departure were two of the more striking moments on an otherwise unremarkable first day, but five days is a long time in cricket and lots could still happen in this match.